Where Can I Buy Stained Glass Lead Came in the UK? Welcome back! There are suppliers in the UK, but they might be hiding their light under a proverbial bushel… Creative Glass Guild in Bristol sell lead came in all shapes and sizes – including edging. Creative Glass in Rochester, Kent are renowned for their stained glass art supplies, but I haven’t been there so can’t personally recommend. Both do mail order, if you’re not close enough. Just Google them and you’ll find them easily. Can I Fix Mangled Zinc U Channels? I’ve been doing some stained glass and have a U-channel zinc edge that I got from the glass shop in a 3 ft length. When I bought it the clerk wrapped it into a loop with the channel facing out. I’ve never edged a project before so I didn’t know better at the time. When I went to uncoil the zinc channel the place where the loop was is mangled pretty severely. I have a stretcher but I have never used it. How do I use the stretcher to unmangle the zinc? Ozzie Berke contributes: When you purchase ZINC IT SHOULD NEVER BE BENT by the supplier. I am astounded. Zinc u cap is only bent with a came bender to fit an exact curve like on a transom or a circle. Even if you have a came bender, I doubt you will ever satisfactorily straighten out a piece of ZINC. Lead came is a whole different story. Best Outside Lead Profile For Panel? Can you buy lead that’s only opened one side to make the border / frame? Milly’s reply: Hi Janice, the good news is, yes, you can. In the UK it’s called ‘C’ section lead, due to the cross section that makes the shape of a ‘C’. If you think about the internal stained glass lead in a panel being like an ‘H’, so that it can accommodate pieces of glass on either side, you’ll hopefully see what I mean. Have a look at my Stained Glass Lead page for more information on the different types of lead available. Hope that answers your question. I want to frame my round glass panel but have no clue on how to do it. 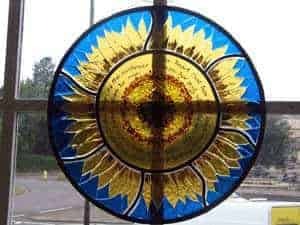 I’m new to stained glass and understand there are different methods of doing this. Thanks for your question. I would suggest lead came, as it’s flexible and comes in lots of different widths and profiles. You can choose what suits your project best. For a round project I would go for ‘C’ shaped, rather than ‘H’ shaped stained glass lead came because it will give you a really nice neat edge. If you’re unsure what I’m talking about – it often happens! – then have a look at my Stained Glass Lead page; it will give you an overview of the different types available. Soldering is another skill that you’ll need. I’m assuming that you have the right type of soldering iron for the job? It has to be at least 80W to cope with melting the solder, preferably 100W. If so, then I have a free tutorial on Soldering here, which will show you the steps you need to take to solder your frame together.